At long last, it is Spring. All around us, the ancient miracle is happening once again. The season of Death is behind us, and new life is springing up. You have an invitation to join that renewal, but the Earth will not wait for you. So don’t delay until the yeast has raised the dough; make your bread without it. Have your walking stick ready; it’s time to go. The stone has been rolled away and the path to the light is open. Are you coming? It’s too late to wish you could be replanted somewhere else, because it’s time to sprout. Here. Now. It’s Easter. This week’s featured post is “Buttigieg vs. Pence“. You also might want to look at the church service the quote above is from. I’ve never liked Easter services, but that year I volunteered to lead a service in my hometown without realizing that date was Easter. With some trepidation, I accepted the challenge and did an all-spring-holidays-at-once service. I’m happy with how it came out. If you don’t care for Easter services either, check it out. This was a question that united a number of news stories: the purge at DHS, Mnuchin’s refusal to let the House Ways and Means chair see Trump’s tax returns, the plan to dump detained immigrants in sanctuary cities, and whether Trump offered a pardon to the Custom and Borders Protection Commissioner to induce him to ignore laws about applicants for asylum. DHS Secretary Kirstjen Nielsen resigned last Monday, just in time for me to mention it in last week’s summary. Tuesday, Acting Deputy Secretary Clare Grady was also forced out, leaving the Department in the hands of the next-in-line, Kevin McAleenan. Secret Service Director Randolph “Tex” Alles was ousted, and at least two officials have been named as possibly heading out the door: US Citizenship and Immigration Services director Francis Cissna and Office of the General Counsel’s John Mitnick. On April 5, Trump withdrew his nomination of Ron Vitiello to lead ICE, saying he wanted to go in a “tougher direction”. Vitiello was already the acting head of ICE. Thursday, a Washington Post scoop began to flesh out what a “tougher” head of ICE might do. The White House believed it could punish Democrats — including Pelosi — by busing ICE detainees into their districts before their release, according to two DHS whistleblowers who independently reported the busing plan to Congress. … Homeland Security officials said the sanctuary city request was unnerving, and it underscores the political pressure Trump and Miller have put on ICE and other DHS agencies at a time when the president is furious about the biggest border surge in more than a decade. Administration sources initially described this as a “nonstory”, but then Trump himself verified it. This fits into the larger context of the Trump administration breaking down barriers between politics and law enforcement. Little by little, we are losing the democratic ideal that political appointees set priorities and make policy, while the government’s career professionals are mission-driven and carry out their jobs apolitically. Instead, Trump is moving us toward the authoritarian model where everything is political. Masha Gessen makes a good point: This is one of those stories that is wrong on so many levels that it’s hard to know how to respond. Merely pointing out the illegality of using government resources to punish uncooperative congresspeople yields a point that shouldn’t be yielded: These immigrants are not a plague. They don’t bring crime and drugs and disease as Trump keeps claiming. Here’s a message to President Trump: Seattle is not afraid of immigrants and refugees. 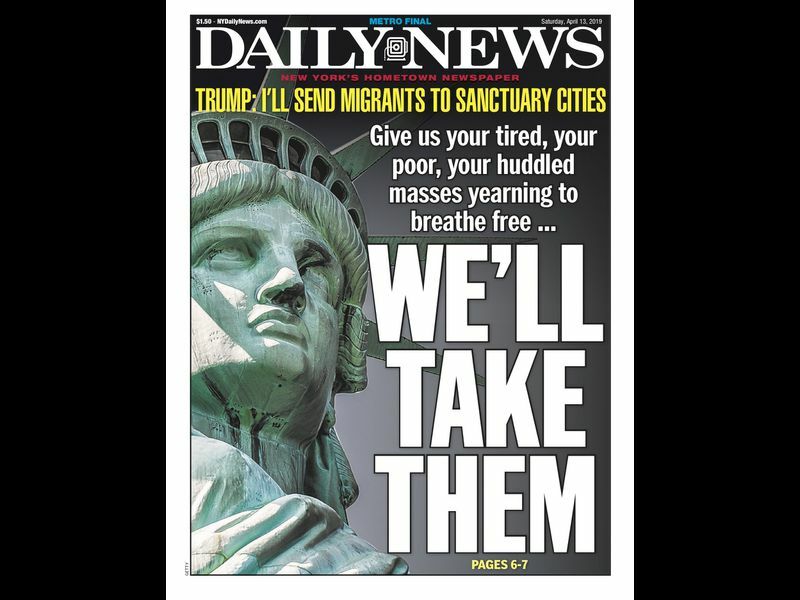 … This president believes that immigrants and refugees burden our country and burden cities like ours. But he could not be more wrong. In Seattle, we know that our immigrant and refugee communities make our city a stronger, more vibrant place. … So if this president wants to send immigrants and refugees to Seattle and other welcoming cities, let me be clear: We will do what we have always done, and we will be stronger for it. And it will only strengthen our commitment to fighting for the dignity of every person. We will not allow any administration to use the power of America to destroy the promise of America. I think it’s important to keep telling immigrants’ stories, because they’re so antithetical to the image Trump is trying to sell us. Mother Jones tells about Ansly Damus, a Haitian who legally sought asylum in the US, and has been held like a prisoner for two years. House Ways and Means Committee Chair Richard Neal requested six years of Trump’s tax returns last week. The law authorizing him to make this request is clear: It instructs the IRS to deliver the documents. Think about what Mnuchin is putting forward here: that the executive branch has the right to judge the “legislative purpose” of the legislative branch. In other words, Congress is not really an equal branch of government. It’s laughable that Trump can question the intelligence of Chairman Neal. Netanyahu will be prime minister for another term. Israel will impose its will on Palestine, and keep pushing until there’s another intifada. I continue to believe that ultimately this situation is headed towards an ethnic cleansing. His arrest raises a bunch of issues about freedom of the press that I haven’t unraveled yet — like “What’s the difference between journalism and espionage?” — so for now I’ll just link to a CNN article that points to the complexity. There’s a new deadline: Halloween. It’s still not clear what will be different then. Channel 4 commentator Jon Snow (not the Game of Thrones guy) touched off an uproar while he was covering a rally outside the Prime Minister’s residence by angry pro-Brexit protesters. “I’ve never seen so many white people in one place,” he said. If Attorney General Barr has been telling the truth, his redacted version of the Mueller report should come out this week. (Thursday, possibly.) Trump has gotten nearly a month to shape a “no collusion, no obstruction” narrative, which his base will probably continue to believe even if the report says something different. The Trump tweet linking Muslim Congresswoman Ilhan Omar and 9-11 is not worth discussing in itself. The speech Omar’s one line was lifted from was making the point that Muslims are not collectively guilty for 9-11, so attacking their civil liberties was unjustified. Trump’s tweet essentially makes the point that Muslims are collectively guilty for 9-11. I think we all (in one way or another) resemble people who have done bad things, so any support for the idea of collective guilt should threaten all of us. What is worth discussing is the role Trump is playing in what has come to be called “stochastic terrorism“. Omar reports that her death threats have skyrocketed since Trump’s tweet, and Nancy Pelosi has asked the House Sergeant-at-Arms to pay special attention to Omar’s security, noting that Trump’s “hateful and inflammatory rhetoric creates real danger”. Over the last two weeks I’ve been raising the question of whether Republicans would allow Trump to fill the Federal Reserve Board of Governors with stooges like Stephen Moore and Herman Cain. I mean, it’s one thing to let know-nothings take charge of education or public housing or the environment, but this is money we’re talking about. Billionaires and multinational corporations are counting on money to continue having meaning, so you’d think Republicans in Congress would want to keep the likes of Moore and Cain from screwing around with it. It turns out they do. Four Republican senators — Cramer, Romeny, Murkowski, and Gardner — have come out against Cain’s nomination, which pretty much dooms it. Stephen Moore still might get the job. Politico’s account of Trump’s visit to Mount Vernon sounds like something from The Onion. I’m looking forward to a book that comes out this week: A Lot of People Are Saying by Russell Muirhead and Nancy Rosenblum. It talks about conspiracy theories, and about a subtly different concept: conspiracism. Conspiracism, though, is “conspiracy without the theory”. There are no dots to connect, just a bald assertion that somebody you don’t like is up to something. For example, Trump’s claim that elections are rigged to favor Democrats (and hence that he’d have won the popular vote without the millions of illegal Hillary votes) is not an actual conspiracy theory, because he offers no explanation of how this could have happened. It’s not at all like a Kennedy-assassination theory, where the theorists can drown you in detail. It would be great if white people would listen to black people’s explanations of privilege, but for a lot of whites that’s just never going to happen. So there’s a need for articles like this one by white NBA player Kyle Korver, where a white guy suddenly gets it. I’ve got to plug an explanation of the current Supreme Court gerrymandering cases co-authored by my nephew Mike Stephens, a recently-minted lawyer. It’s important to recall in the immigration-to-sanctuary-cities story that population growth in itself is a driver of economic activity. In fact, it is one of the most basic forms studied in economics. The new population require food and clothing and housing and other basic services, and where they are more successful, they add other demand. And they provide a base increase in available productivity of the same proportion. Even Piketty addresses this in his great book on capital and inequality – this is one of the two primary causes of wage-derived wealth of a population. So if immigrants are focused in certain locations, that will only drive their economic engine faster. A population growth of 5% per year would be a boon. Only up to a point, though, I would think, because that also puts more demands on infrastructure like roads and schools. At least, my area is experiencing significant growth and it’s definitely coming with problems as well as benefits, and some folks are being left behind. (This does not, of course, change the fact that we should welcome immigrants as fellow human beings). This is the most dangerous statement of this presidency. With this, DJT has announced that not only does he believe himself to the above the law, but he is also prepared to make all of his followers above the law. Where does it end? If someone can be pardoned for illegally closing the border, can someone be pardoned for murdering one of DJT’s political opponents? How about murdering one of his critics? How many can be pardoned in a day? What if DJT is in danger of losing the next election and he tells people to go and riot on election day near certain voting stations, and then pardons all who do? I have not been interested in impeaching DJT before this, but now I think it is a must. “When you have more power than you need, you build the tower higher. When you need more power than you have, you let a block fall, generating power as it goes.” This can also be done by pumping water uphill when you have more power than you need. I have been to a power plant that worked that way!